You can't teach height. Even if the Smart Gilas players are more skilled than the Iranians, they still failed to defend well against the much taller Iranians. Gilas lost against Iran but the final score will tell you that the game was close right from the get go. The final score was 80-77. Iran won by only 3 points. That's a great improvement on the side of Gilas because during their last meeting in the 2010 Asian Games, Iran won by 17 points, 48 to 65. Gilas made a great improvement this time. As a Filipino, I was really happy when I saw that Gilas fought tooth and nail against Iran which is known as a very powerful Asian basketball team together with China. In fact, Mahram Iran is a two-time defending champion of the FIBA Asia Champions Cup. I believe that Gilas is slowly reaching their lofty ideals in the world of basketball and to think that Gilas only have a naturalized player in Douthit and Iran has Cheikh Sambs as their american import, Gilas really has become a strong team. We don't have an import but we still did quite well against the Asian powerhouse. Take note, we just served a great game against an Olympic type of a team. Iran has been in the Beijing Olympics and they've fought against the likes of team USA and the Spanish National team. Iran's top guns had to some extra work for their team to win in this game. Nikkhah Bahrami, their go-to-guy and the most famous Iranian player aside from Hamed Haddadi of the Memphis Grizzlies, scored 19 points in this game. Most of his points came from hard shots and outside shots because he was well guarded by Gilas' defenders. The other big gun of Iran, Mahdi Kamrani, their veteran point guard scored 17 points and he defended Chris Tiu quite well. As a result Tiu had a hard time in shooting the ball. Iran's 7'1 NBA veteran import, Cheikh Samb had 17 points including several blocks on Douthit. Iran's other import, Chris Williams scored 16 big points. They had 2 imports while Gilas doesn't have one. Imagine that disadvantage. Even if Marcus Douthit was blocked in several instances by Sambs, he was still able to score 25 big points and he also grabbed 13 rebounds. Doutthit was the reason why Gilas was able to keep the game close. Jayvee Casio helped in scoring for Gilas with 21 points. His points came mostly from beyond the arc. But for me, his Iverson like lefty lay-up was the play of the game. These two players of Gilas were the reasons why Iran never had a big double-digit lead. Casio was the reason why the game was tied by the end of the 4th quarter. He made a three-pointer to beat the buzzer. In the start of the 4th quarter, Iran had a 15-7 run and from then on, Gilas has trailed until the end of regulation. In the last 45 seconds of the ball game, Chris Tiu made a great decision to just make a 2 pointer that cut the lead of Iran to just 5 points and then Jayvee Casio was able to steal the ball from Iran. He immediately passed the ball to Chris Tiu for the open three. Tiu nailed the shot and the lead of Iran was only down to 2 points. Gilas fouled an Iranian to send him on the free throw line. He nailed both free throws. The next offensive sets of Gilas went into disarray and eventually they lost to Iran. They will now face Qatar for the bronze medal today, Sunday. Iran and Lebanon on the other hand will fight for the Gold medal finish. This lost of Gilas is just the start of something big for Smart Gilas. We've seen how they play and they really have the potential to be in the 2012 London Olympics. Of course they will have to do some more work and they have to get Kelly Williams and Jimmy Alapag involved in their offense. 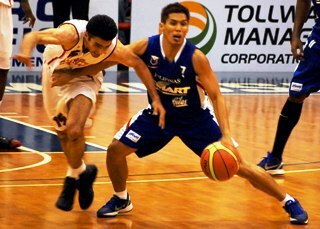 On June 15, Kelly and Jimmy will start practicing for Gilas in preparation for the upcoming 2011 FIBA Asia Championship.